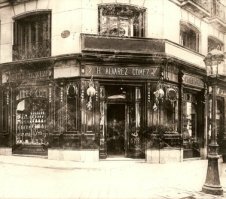 Alvarez Gomez is a Madrid-based, family-owned business that dates back to 1899, and Agua de Colonia Concentrada is its signature product. This traditional cologne is reportedly an easy item to find in shops throughout Spain, but it was virtually unknown in the United States until MiN New York began importing the Alvarez Gomez line last year. 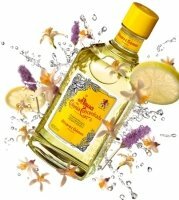 According to the company, Agua de Colonia Concentrada is "a very fresh, clean and natural-smelling cologne enhanced with carefully chosen essences of Mediterranean plants, flowers and fruit"; its official notes are Spanish lavender, lemon, geranium, eucalyptus, rosemary, thyme, English lavender and bergamot. Agua de Colonia Concentrada was created in 1912, and Alvarez Gomez claims that its formula remains unchanged. I don't know whether that's entirely possible, but in any case, this fragrance does smell timeless, as a classic cologne should. It's a strongly citrus-based interpretation of Eau de Cologne, with a tart, bright lemon note that evokes the peel as well as the pulp of the fruit. The lemon is almost brilliant for the first few minutes on skin; when you smell it, you'll understand why Alvarez Gomez has chosen such a vibrant yellow for its packaging. The lemon does calm down after a short while and lets the bergamot and the geranium make an appearance. The secondary notes of lavender and rosemary gradually bring a hint of greenish spice to the scent. The whole thing ends up feeling clean, but in a sunny way rather than a soapy way, if that makes sense. Agua de Colonia Concentrada is meant to be splashed on liberally, like any Eau de Cologne or toilet water. If you end up enjoying the scent, you can explore a full line of products including (but not limited to) fragranced body lotion, shower gel, deodorant, and luxuriously hefty bars of soap. I'm particularly fond of the individually packaged "Refreshing Perfumed Towelettes," which are perfect for touching up on the go; just a few swipes on my arms and neck make me feel cooler and crisper. I'm not an expert on every classic Eau de Cologne on the market, but I did enjoy a brief Acqua di Parma Colonia phase a few years ago and I'm still loyal to Murray & Lanman Florida Water (which helped me survive Summer 2010, the hottest on record for my part of the world). I'd say that Alvarez Gomez's Agua de Colonia Concentrada is simpler than either of those, with fewer noticeable herbal and floral notes (not to mention a much lower price) than Acqua di Parma and less spice than Murray & Lanman. This simplicity is not a bad thing at all. Agua de Colonia Concentrada's directness makes it an uplifting variation on a classic theme and an affordable basic for any fragrance wardrobe. Alvarez Gomez Agua de Colonia Concentrada is sold in various sizes, including 100 ml ($30), 150 ($38), and 220 ml ($44). For purchasing information, see the listing for Alvarez Gomez under Perfume Houses. Note: you can view an enjoyable 2-minute video compilation of vintage Alvarez Gomez advertisements (by "Vintage Lady") here. I love simple and classic colognes, I’d love to smell this! Cinnamonster, It’s so refreshing, and it’s getting a little easier to find, so keep your eyes out for it! Is this the sort of eau de cologne that is sufficiently diluted so that I can re-splash it after a couple of hours to get another hit of cooling fragrant liquid?. Dilana, yes, definitely! Since this is just an eau de cologne, the fragrance evaporates within an hour or so, and you could reapply whenever you like. It’s virtually impossible to overdo! I don’t really understand though why someone would want a product that disappears so quickly. If citrus notes were necessarily short-lived then periodically taking a cooling splash would be the only way to get them – but if some perfumes contain refreshing notes (including citrus) that will linger (refreshingly) on the skin for hours, then isn’t that a more attractive option? Not with a heat index of 115 in an un-air conditioned apartment. Spritz me, baby! When its that hot I like pouring water straight on my head! I would say it’s widely available in Madrid but not the rest of Spain. I have seen it often at office buildings as complementary toiletries, it’s quite refreshing and crispy, perfect summer after shower scent. I’m Spanish and I live in Spain and I can tell you that this cologne is easyly found in the main perfume shops It’s my father signature scent and I love it. I always bring it to him on his birthday or in Christmas. It’s one of the best colognes I’ve ever tried. I’m happy that now it can be tried and reviewed by perfumistas in USA. I’ve never even been to Spain (alas)… so, thank you both! I’ve been waiting for someone to review this – I also ran into this at MiN when I went for the 1st time last year – it sounds like the perfect cure for the summer time heat here in Miami and all of those body products sounds like they’d extend the scent nicely also. I want one of those honking 220 mls bottles that I can display on the edge of my Jacuzzi tub in my bathroom. It would match perfectly with my color scheme. Mike, I love the idea of those giant bottles… and yellow is such a great color for a bathroom! It looks like bottle of tequila to me. Ikat, not a bad thing at all!! I just checked the MiN website, and they also have 400 ml ($65) and 750 ml ($100) bottles, as well as a 5 ml mini for $2. With the 750 ml size, you really could use it liberally! I like the idea of being able to soak myself with it on a hot day. I think you could practically *bathe* in it!! hah. But the mini idea is nice, too. I like lines that offer a variety of sizes!